I played golf with my parents today. The familiar routine of this activity provides a certain timeless comfort, akin to eating meatloaf and mashed potatoes or watching I Love Lucy reruns. My father always shows up an hour early with a soiled and crumpled hat that has been stuffed in the trunk of his car, wearing shorts that are several sizes too big, with no piece of clothing matching another. My mother arrives carefully put together in a color-coordinated outfit from the Hillary Clinton line of golf wear. In lieu of stretching or hitting balls at the practice range, my father then warms his seat in the golf cart for the next hour waiting anxiously for his name to be called to tee off, while my mother chats with the cashier in the golf shop, or the parking valet, or the locker room attendant, or the starter, or the girl driving the snack cart, or ….. When we get to the first tee, my father parks the cart as close as he can get to the tee box, finding the optimum distance to minimize any walking while avoiding hitting it on his back swing. He has a handicapped flag that allows him to drive the cart wherever he wants. He got this flag many years ago before having most of his body parts replaced. His current body is younger than mine and virtually indestructible, but there is no way he’s giving back that handicapped flag. Once he arrives at the tee, he finally emerges from the golf cart, places his driver laterally behind his back and rotates once to the left and once to the right. That is his warm up. He then tees the ball up, smashes it with the force of Joe Frazier punching Muhammad Ali, ands sends himself into back spasm. My mother then carefully tees it up, precisely chooses her target (although not always the right one) and meticulously checks her stance, grip, posture, sun visor, watch, cell phone, stock portfolio….and ultimately smacks it right down the middle. She then records her shot on her portable shot counter. She meticulously records every shot contemporaneously so as not to forget or make mistakes. She is the only golfer in the world that doesn’t cheat. She believes that she won’t go to heaven if she doesn’t accurately count all her strokes (and there are a lot of them). If she is right, she will have no one to play with when she gets there. As my father approaches his second shot, the golf lessons begin. 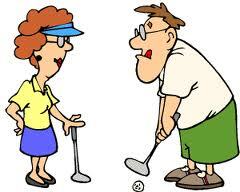 Often the best teachers are not the best golfers and vice versa. This is certainly true with my mother. She is excited when she breaks 120 (which would be 100 if she cheated like the rest of us). Nevertheless, she is an expert golf instructor. As he stands over the ball, she tells him to swing easy and keep his head down. He promptly wacks at it with his Joe Frazier swing, quickly lifts his head to watch his achievement and sends it three yards. He then glares at her while she tells him that his grip was wrong. This pattern repeats itself for the next four hours. She persists in trying to fix his game, his wardrobe, his manners, his exercise regimen…..He persists in ignoring her. It’s been working perfectly for 55 years. This entry was posted in Humor, Ruminations, Sports and tagged Humor, Musings, Relationships, Sports. Bookmark the permalink. In my house, we cook the hell out of pork. I played golf with my parents today. There are 49 pillows in our three-bedroom apartment, not including couch or seat cushions and travel neck rolls. My college roommate still cracks me up way before he gets to the punch line. Larry David’s got nothing on the Annunziatos! I read this to mommy and daddy and we were all crying from laughing so hard. Mommy says her jaw hurts. That is grandma and grandpa to the t! no pun intended.